How to use Por and Para in Spanish – The only book you’ll need. Pocket Por and Para. Just released! Do you have problems using Por and Para in Spanish? Are you unsure which one to choose from when faced with saying ‘FOR’ in Spanish? If that’s true for you then Pocket Por and Para is the ideal tool to help you clear up the mystery once and for all. We like systems, especially if they are easy to follow. This is precisely what our new book offers you. An easy to follow, simple and logical system that will coach you through all of your confusions. Once you have sailed through the chapters and completed the easy to understand, easy to do exercises, you will be left with no doubt about how to use Por and Para in Spanish like a native speaker. They are difficult because of a few issues. Firstly, for all of us who learnt French at school, the desire to use POR is almost addictive. Yet, as you will discover in the book, that can be our biggest mistake. Secondly, in English we often just have the word FOR, which gives us no clue as to whether we should choose Por or Para in Spanish. The great news is that although the word FOR gives us no clue, Pocket Por and Para will show you how to see the clues in the surrounding words. And trust us when we tell you that once you’ve read the book, the clues will be so obvious you’ll be wondering why you never saw them in the first place. Available from Amazon and in Kindle format soon. Right now you can get a hold of your copy of Pocket Por and Para from Amazon.com and Amazon.co.uk and soon it will be available in the vast majority of online book stores. As we write this blog, it is also being converted into Kindle format and will be available within a few more days. Pocket Por and Para is an easy read. It’s not technical nor does it steep itself in heavy grammar. It has been designed with you in mind and we feel confident that it will take you to a place of confidence when you go out into the real world and begin to use Por and Para in Spanish, de verdad. We would like to thank you for your support and for helping us to be able to help so many other people in turn. 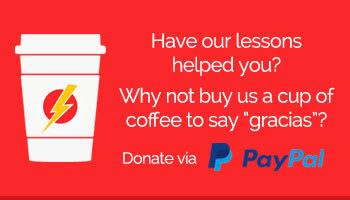 Our goal continues to be what it always has been: To help people learn Spanish easily, fluently and with fun.